A fellow photographer, a devotee of the 35mm decisive moment school of shooting, once asked me about my affection for the 8×10—“don’t you sometimes feel like you get to the end of the day, and you missed most of what happened?” and I laughed—because if you’re working with a big camera, the whole point seems to be to miss the action, to look for things that move so slowly that they seem never to change at all. 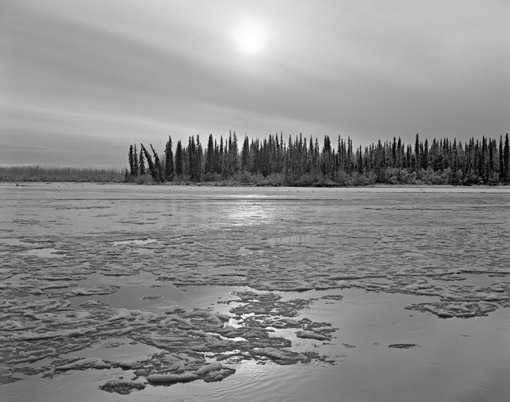 I’ve been living in Fairbanks for nearly 20 years now, and one of the first few things I photographed when I came to town was the flowing ice on the Tanana River during freeze-up, in October. One of my first trips to the river I made several photographs of the sun shining through thin high ice clouds as the pan ice moved in front of me, as perfect an image of the onset of winter and the coming of darkness as I think I’ll ever make. But there is the other transition, break-up, when the cold dark winter yields to the sun and warmth of summer, but I’ve never been able to catch the river in the act, even though it is only a few miles from my house. Until this year. Over the past three days, the temperatures have been close to 60, the sun bright and warm, and I’ve been heading to the banks of the river to look for photographs. And I think maybe this time I’m catching the action. Every year, the river freezes, and the following spring, the river breaks up. It never makes the news, and almost no one comes to watch either event. The spot where I made the first of these photographs has been fenced in and posted off limits, the second photo is from down-river a quarter mile or so. But is the leaning tree the same tree? Or does the river’s current devour them one by one? I only spend an hour or two by the river each time I visit, and I know the river keeps on flowing after I’m gone. I always miss most of what happens. But most moments are not decisive. The act of tripping the shutter is, for me, an attempt to recognize the stillness of the moment, and the forces that shape it: the light, the flowing river, and my own life, moving in the current. 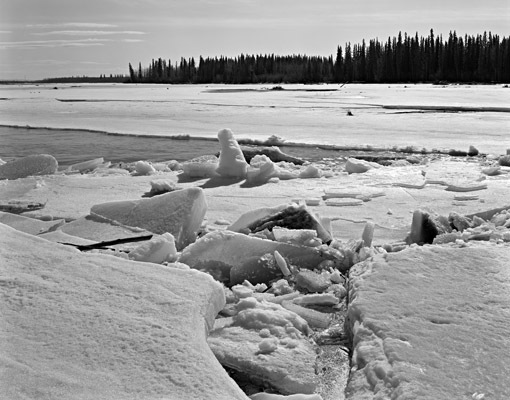 I was reading this post with the image of the Tanana River at Freeze Up centered in the page with text above and below. The image slowly changed as I read and the flat gray sky that only had hints of clouds slowly gave way to the disk of the sun. It reminded me of the time that I sat in a gallery with your show and off to the side were all these 4×5’s with the same scene printed over and over. Each one was different than the next. At that point I had to start playing with the brightness of my screen, to look at this image both lighter and darker. It was a poor substitute but I still enjoyed it.